Aren't all doctors trustworthy? When it comes to health care, there are doctors who engage in the practice of draining your wallet. 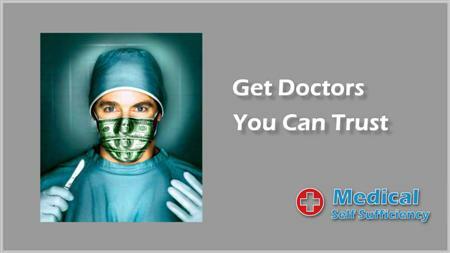 But amazingly, there are also doctors who actually want to help you protect your finances. How can you tell the difference? How can you find such a doctor, and work together with him or her to reduce the cost of health care? Watch This Video. 17 minutes. Who do you trust? How much do consumers trust doctors, hospitals, pharma, insurance and government? Hint - pharma and hospitals rank pretty low on the "Trust Meter" for most patients. Does your doctor feel the same way you do? If not, you have a problem. The system will tell you that you need a "Team Of Specialists." That's the best way to make sure that you get loaded up with all of the hospitalizations and surgeries and tests and treatments that the doctors will require in order to meet their income goals. The system is rigged to cause health care cost inflation, at your expense. Learn how it is done, so that you can escape it. So, are doctors overpaid? Some are. But the system is rigged AGAINST private practice family doctors. So there is your clue. These are the doctors you should seek out. Find out why, and how to find them.